New U.S. sanctions against Russia over a nerve agent attack in Britain have come into effect. The sanctions will terminate some financial assistance and arms sales to Russia, as well as deny the country credit and prohibit the export of security-sensitive goods and technology. It is natural that top authorities on Russian economy immediately voiced their opinions on the probable consequences of the new sanctions. It’s interesting that the opinions varied from labeling the events as insignificant to predictions of a major catastrophe. The Russian Foreign Ministry stated that the new sanctions will only make dialogue more difficult. Russian President Vladimir Putin has labeled the latest US sanctions as “counterproductive and senseless”. On May 7, right after his inauguration, President Vladimir Putin signed a decree in which he set goals for the government, which must be achieved by 2024. To do this, he proposed to create projects in twelve areas of socio-economic development. The Cabinet of Ministers already approved the goals, as well as the forecast for the development of the country. Information on the projects are primarily to provide information for business about where and what the state will do, where it will invest resources and what conditions it will create for private initiative. It’s obvious that civil servants in themselves are unable to achieve an increase in labor productivity by the desired five percent annually, but supporters of the national projects believe that they can help create the conditions for business to increase labor productivity. Not everybody shares Anton Siluanov’s optimism about future success of the national projects. Alexey Kudrin, Head of Accounts Chamber of Russian Federation, speaking at a meeting of the Board of the Russian Union of Industrialists and Entrepreneurs on October 10, stressed that more than half of the indicators of national programs prepared by the government are not available form official statistics. Therefore, it will be problematic to track their implementation. Alexey Kudrin is a rare case of a politician and a statesmen equally admired by Putin and many of his liberal opposition. 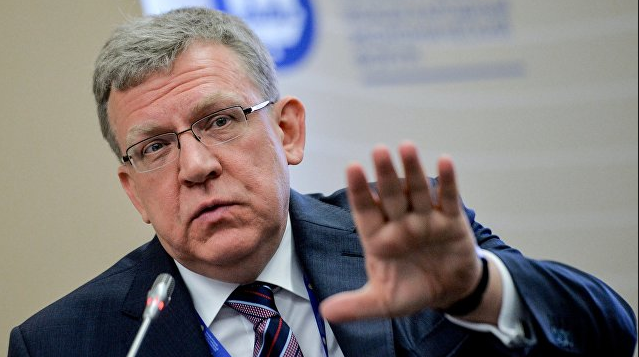 “Alexei Kudrin, (born 12 October 1960) is a Russian liberal politician serving as the 4th and current Chairman of the Accounts Chamber since 2018. Previously he served in the government of Russia as Minister of Finance from 18 May 2000 to 26 September 2011. In 1996 he started working in the Presidential Administration of Boris Yeltsin. He was appointed as Finance Minister on 28 May 2000 and held the post for 11 years, making him the longest-serving Finance Minister in post-Soviet Russia. In addition, he was Deputy Prime Minister in 2000–2004 and again beginning in 2007. As Finance Minister, Kudrin was widely credited with prudent fiscal management, commitment to tax and budget reform and championing the free market. “Under Kudrin, Russia’s government paid most of the substantial foreign debt it had accumulated in the 1990s, leaving the country with one of the lowest foreign debts among major economies. Much of the revenue from exports was accumulated at the Stabilization Fund which helped Russia to come out of the 2008–2009 global financial crisis in a much better state than many experts expected. During his career, Kudrin has won several awards, including the “Finance Minister of the Year 2010” prize from Euromoney magazine. He was asked to resign from his position on 26 September 2011 by President Dmitry Medvedev. Kudrin’s speech at the meeting of the Board of the Russian Union of Industrialists and Entrepreneurs was quoted in the article published October 10, 2018 in the popular site Gazeta.ru under the title: “Overseas threat: new sanctions will finish Russia”. The article informed, that earlier, the Bank of Russia presented already a risk scenario, which included “prerequisites for a significant deterioration in external conditions for the Russian economy, a weaker growth dynamics of the world economy and international trade”. The deterioration of external conditions includes, in particular, “the risks of further expansion of international sanctions against Russia,” as well as the fall in oil prices to $35 per barrel in 2019. In case if all negative factors will be combined at the same time, the Bank admits possibility of “moving of GDP growth rates to the negative area.” The possible scales of this “moving” are not indicated. Analytical credit rating agency (ACRA) in the “alternative + financial stress” forecasts scenario making GDP fall by 2.5% next year. The official forecast of the government, which was prepared by the Ministry of Economic Development, suggests that this year the economy will grow by 1.8%, and next year the growth will slow to 1.3%. According to the head of department, Maxim Oreshkin, in the first quarter of the next year, the growth rate may be lower than 1%, and inflation will rise to 5%. The forecast for prices growth at the end of this year is 3.4%, at the end of next year it is 4.3%. There are now several bills in the US Congress, that call for the introduction of new restrictive measures against Russia. In particular, the possibility of imposing a ban on the purchase by US residents of new issues of Russian debt securities and restrictions on dollar operations for banks with state participation is being considered. It is difficult not to notice that, the picture of the world presented by the Ministry of Economic Development differs from that of the Ministry of Finance. As you stated above, First Deputy Prime Minister, Minister of Finance Anton Siluanov, is predicting tremendous success for the Russian economy. We can add that speaking at the Federation Council, Siluanov optimistically assured a 6.3% increase that in 2018 in real incomes of the population will become one of the factors accelerating GDP growth! Which department’s forcast is closer to the truth? What is actually ahead for the Russian economy? “Siluanov is more optimistic in his assessments, apparently because he received a higher position in the government, and he is now in a better mood than the head of the Ministry of Economic Development,” ironically states Andrei Bunich, president of the Union of Entrepreneurs and Tenants of Russia.